We keep talking about it and the bass keep eating it. 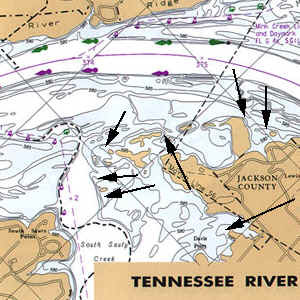 This has always been the one of the most productive ways to fish Guntersville during the any season. Green pumpkin, plain pumpkin, watermelon seed, June bug and black, yeah, that covers my lizard box and has as long as I can remember. I have never seen a color out fish one of these colors on a regular bases. I have had many folks in the boat doing as well as I was on many different colors but they were rarely doing much better. And, If they did out fish me it was usually smaller fish. I fish my Carolina Rig with 3/4oz weight and 18 inch leader 99.9% of the time. The same colors hold true for worms although you might catch me using red bug or red shad as well. The map below might look familiar to you if you have read my tips before. These types of places are easy to find, easy to fish and very numerous. If you plan to fish the Carolina Rig a lot on Guntersville, your chances of catching some nice fish are simply at their best. Just remember there will likely be only two more tips you need to know. First your Carolina Rig needs to land somewhere where you feel grass for the first part of the cast only. This is telling you that you are fishing the true grass edge. In all other areas are you feeling rough gravel bottom? If not, move till you do.